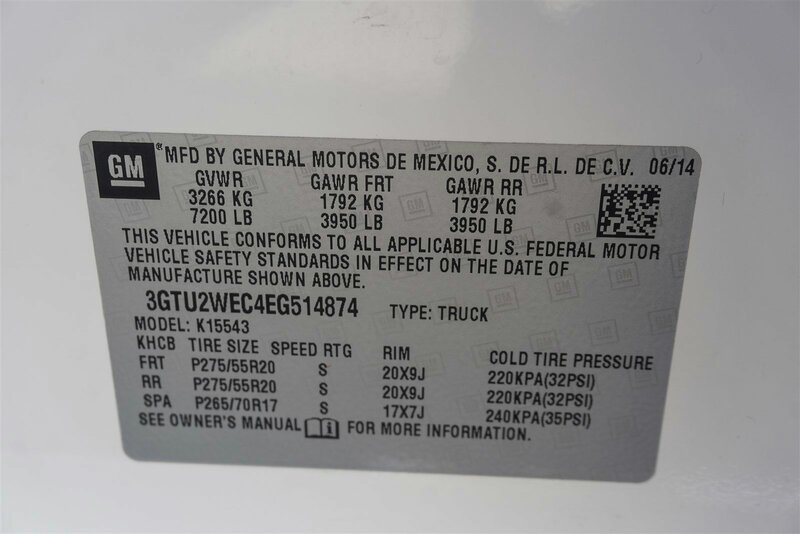 2014 GMC Sierra Denali Crew Cab...Z71...4X4...5.3L V8, 6-Speed Auto Electronic w/ Overdrive...CARFAX One Owner, ** LOCAL TRADE **, ** NON SMOKER ** SAT/ NAVIGATION/ Bluetooth Connectivity **, Foot Pedal Adj., Dual Temp. Zones, ** BLIND SPOT MONITORING **, **OFF ROAD PACKAGE**, **DRIVER ALERT PACKAGE**, **LANE DEPARTURE, 6-Speed Automatic Electronic with Overdrive, Heated and Cooled, Cocoa/Dune w/Leather Appointed Seat Trim.This Sierra has a Chrome Pkg. that includes; Grill, Wheels, Mirror Caps, Door Handles, and Steps. Body Colored Front and Rear Bumpers too!Odometer is 28661 miles below market average!Low Miles too, under 55K Miles!! Call to assure availability at Covert in Hutto at *** 877-918-0151 ***Reviews:* New, more fuel-efficient engines; improved interior; quiet highway ride. Source: Edmunds* The 2014 Sierra's innovative powertrains and handsome aesthetics should appeal to longtime GMC fans and tempt buyers new to the brand. In just one of many mine is bigger battles in the half-ton truck market, the 2014 Sierra's 12,000-pound max tow rating is expected to be king - at least for now. Source: KBB.com* The 2014 GMC Sierra 1500 is all new for 2014. It possesses chiseled features and distinct lines that not only make it look imposing, but increase how aerodynamic it is as well. In front, between the projector beam headlights, there is an incredibly striking and enormous chrome grille. While driving, it takes in a large portion of the air for cooling the engine, and lets the remainder glide across the truck. It is complimented by a bumper made of sculpted steel, a strong angled hood, and bulging fender flares. The changes made to the truck body, and the resulting improvements in air flow, add up to a quieter cabin for you and your passengers. Plus, its new hydraulic body mounts help mitigate vibrations to give you a smoother and more comfortable ride. Open the doors and the Sierra's interior welcomes you into a calming and comfortable retreat from the busy outside world. The seats utilize a new design for lasting comfort, and reduced fatigue. On select models, the instrument panel incorporates a high-end soft feel, combined with trim made of aluminum for an overall look that is very stylish. The instrument panel has been laid out in such a way that your controls are now easier to get to and see, with larger buttons and knobs, which are more convenient to grab. Spoil yourself with the available 8-inch IntelliLink touch-screen system that you can opt for on SLE and SLT trims. It lets you control your radio and make calls hands-free, wirelessly stream music from your phone, use the rear view camera, and operate the navigation system. Base Level Sierra trims on all models come with a powerful 4.3-Liter V6 EcoTech3 Engine with 285 horsepower and a 6-speed automatic transmission. You have the choice between the Crew Cab, Double Cab, and Regular Cab, and all except the Double Cab give you the option of two different box sizes. Plus, since you have the choice between two to three trims based on the model picked, GMC has a 2014 Sierra 1500 for just about anyone. Source: The Manufacturer SummaryAwards:* 2014 KBB.com Brand Image AwardsWhether you are in the market to purchase a new or pre-owned vehicle, if you need financing options, we'll help you find a car loan that works for you! Even if you have bad credit, or are a first time car buyer, you can trust that Covert Ford Chevrolet Hutto will professionally fit you into the automobile of your choice. Please call Dan Covert or text at (512)993-7628 for personal assistance or come out and see us. You can also call the main number (877)918-0151 for assistance. We are just a short drive from these areas Austin, Round Rock, Georgetown, Leander, Pflugerville, Killeen, Temple and other local cities. Please come out and be apart of the Covert family.